Another Microblog: The Yellow, The Sedge & The Salamander. In our last little blog, we wrote about a trio of natural history happenings that seem to be more common this year: Red Admirals, Giant Swallowtails, and Rose Rosette Disease. Over the past couple of weeks in the field around Columbia County, we have also been reminded of the more confirmed rarities – species which don’t seem to be increasing, and which only a fair bit of tromping and luck seem to turn up. They tell us something about our ecology, although perhaps on a more local scale than the species we mentioned last time. A Little Yellow photographed in Copake NY on 22 June. The Little Yellow is a pint-sized sulphur. Although its wing patterning is distinct, the most obvious distinction is that it is closer to the size of a Pearl Crescent than to a Cabbage White (which is the standard size of most of our yellow butterflies). 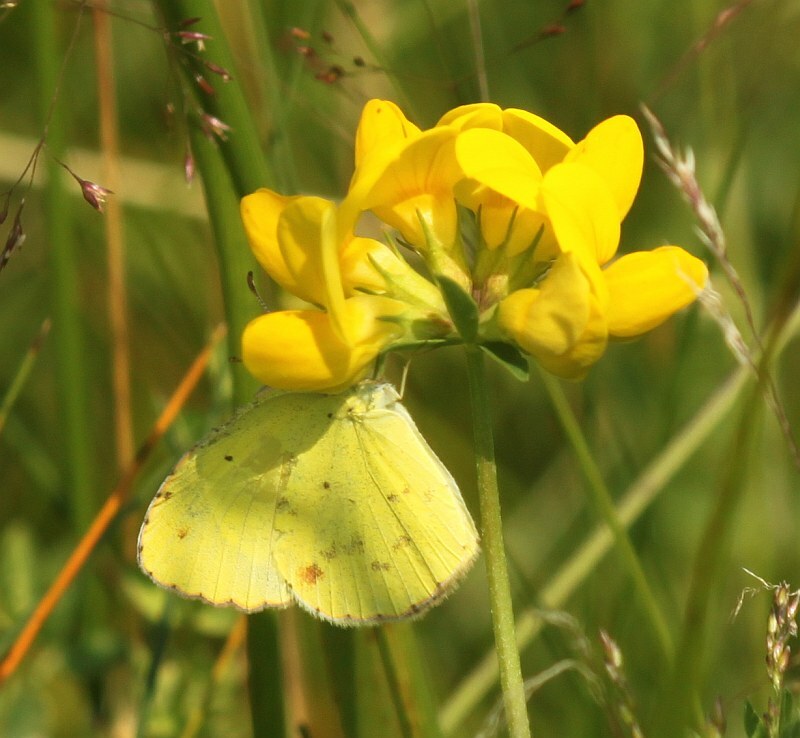 If you scroll down this link, assembled by a Delaware tour company, you can see a photo of a Clouded Sulphur – a common yellow butterfly in our area – together with a Little Yellow. grounds in a lazy manner, as if fatigued after their long voyage over the deep. (For a discussion of changing butterfly abundances, please see our recent column posting). Mass migrations like this, if pointed in the right direction, could easily account for their occasional boom years farther north. However, unlike some southern species, it is not evident that this species has been slowly pushing north. Indeed, recent accounts, such as the CT and MA butterfly atlases, suggest that, if anything, it has become less common. Please let us know if you happen to spot this little creature. A rather flat herbarium specimen of Prickly Sedge from Ancram. For pictures of this plant in vivo, see this page of the Intermountain Region Herbarium Network. Carex spicata or Prickly Sedge is a bit of a puzzle. Claudia first recorded this sedge in the County earlier this month. We have found no previous records of its occurrence in Columbia County. By most accounts, it is an introduced species. It is reported at least as early as 1921 in NY, although confusion over taxonomy suggests that it may have arrived substantially earlier. Carex muricata, for example, is now recognized as a distinct species, but reported as an early synonym. That species was cited near Boston at least as early as 1840. There is no indication that Prickly Sedge is expanding or becoming more common; by most accounts, it is a rare species. In any case, the puzzle is this: if it is indeed a non-native, then how can it be so rare? It is easy to imagine the usual expansion of non-natives as so-called “invasive species” roll across the Country. Once established, new populations arise from the seed cloud created by the initial populations. Alternatively, species that are widely used in horticulture or agriculture, even if not spreading energetically, might be expected as occasional “adventive” populations around sites where they were cultivated. But what of a species such as this? If it really is non-native and yet, so far as we know, never intentionally grown, then how can it be so sparse and scattered? How came it to settle on an Ancram hilltop? Perhaps it has been widely overlooked and is more common that usually reported – how many sedge hunters do you know? Perhaps, it was more widespread during the 19th century when agricultural conditions favored it, and now we are only seeing relict populations? Have you seen it? Again, if you have have, please drop us a note. Look for a clump of near-waist-height sedge (remember, ‘sedges have edges’) in a dry, open area. This is in contrast to most sedges which prefer moist areas. 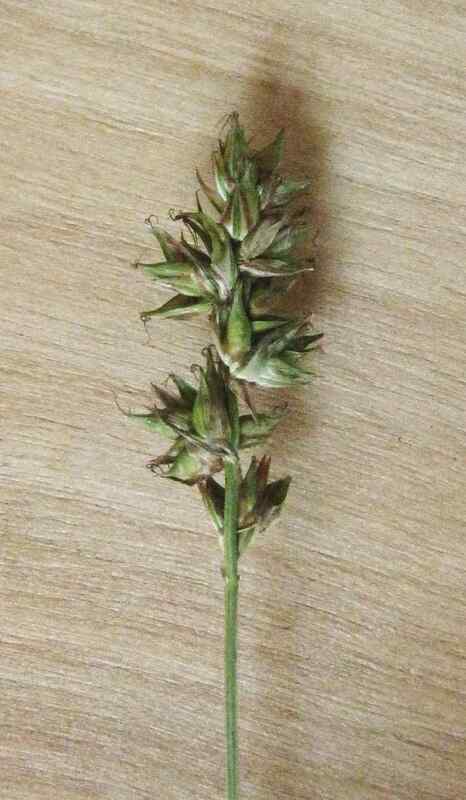 The seed head is relatively large, and the leaves around the base are strongly tinted with purple. See the New England Flora site for more info. A Northern Spring Salamander photographed recently in a clear creek in the southeast portion of the County. Although it is difficult to tell from this shot, this is a relatively large salamander measuring some 4-5″; markedly larger than most of our Salamanders. This species is the bright orange of those nearly ubiquitous red efts, but it is 2-3 times their length and much less commonly seen. Indeed, the New York State Herp atlas and the companion book report no records from east of the River in the lower Hudson Valley, although Michael Klemens does mention one Columbia County capture from the west face of the Taconics. It is, which ever records you take, exceedingly rare in this area, although it is said to be well established in NW Massachusetts. This is an Appalachian species whose distribution stretches from northern Mississippi, Alabama and Georgia through southern Maine, Quebec and Ontario. 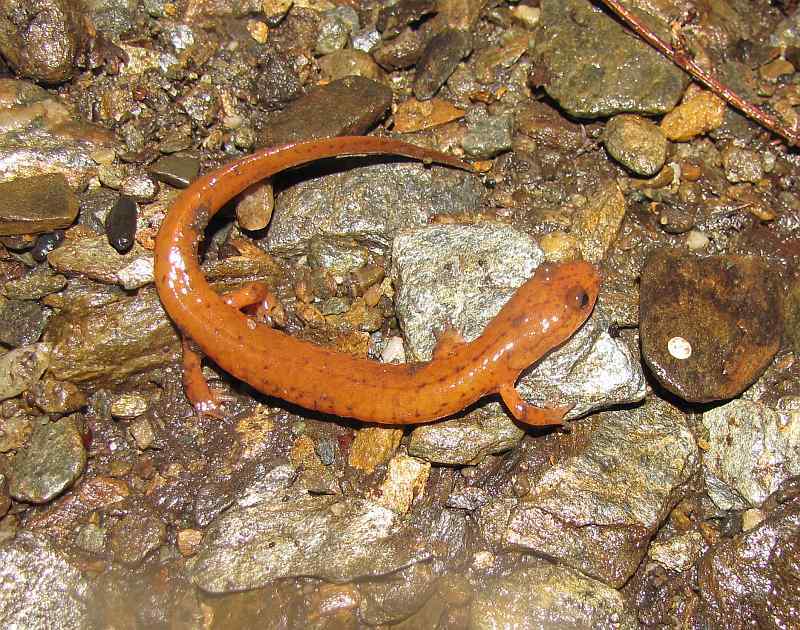 The scarcity of Spring Salamanders is probably due to at least two factors – the actual scarcity of them and their habitats and their secretive ways. Its requirement for clear, cool streams and springs has made it scarce in areas where land use has resulted in pollution or extensive siltation of creeks and the opening up of the canopy. Often favored creeks are, as in the case of our observation, located below ‘perched’ wetlands where seeps coalesce to form swampy areas. Such ‘mud holes’ are rarely valued by land owners. But the habits of these salamanders themselves are elusive. Reportedly, they spend much of their time down beneath the surface of the rocky streambeds. During construction work, one individual was supposedly found some 3′ down, and they are believed to lay their eggs in such underground, underwater haunts. On wet nights, they do apparently come to the surface to hunt, with much of their food being the Two-lined and Dusky Salamanders with which they share their stream ways. During the salamander search that produced our one sighting, 29 Dusky Salamanders and 14 Two-lined Salamanders were also noted. The Spring Salamander exemplifies a native species whose rarity seems to come not from our location on the edge of its range, but from its generally particular habitat requirements and the ease with which human action can disrupt those habitats. However, its inconspicuousness also raises the question of when apparent rarity is actual rarity. To understand the degree to which we are impacting this species, better knowledge of the species’ distribution is needed. If you think you’ve spotted one, please try to take a photograph and send it our way.